Derek did a fantastic job on our kitchen remodel. Our kitchen was completely outdated and the layout was not functional. As this was our first major renovation, we were nervous, but Derek listened to our needs and wants and gave us a kitchen that not only looked spectacular but was highly functional and a great use of our space. He walked us through the entire process, from demolition to finishes, was upfront about costs and gave us great advice along the way. All work was completed on time and within budget. He answered all of the questions we had both before and during the project, and was always approachable and professional in all of our interactions. 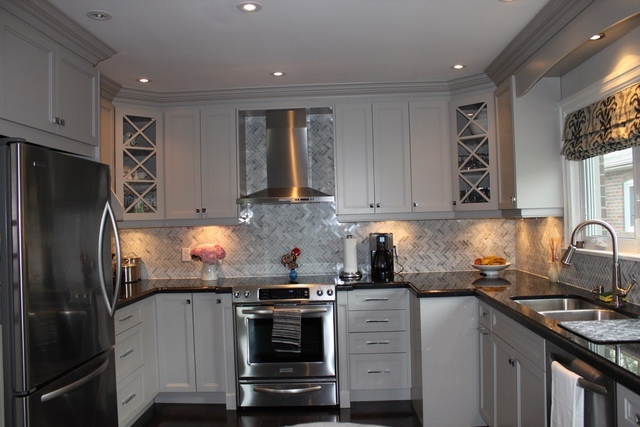 I would highly recommend Perfect Finish Renovations for their professionalism and quality of workmanship. I will be contacting them again for my next project. Thank you for your amazing work! Your very welcome Lucy!! Thank you for all your kind words. I look forward to working with you again. We recently had our ducts cleaned by Dave's Duct Cleaning and we were thoroughly satisfied with their work. Their technicians were knowledgeable, articulate, and had a very professional attitude. They showed us before and after pictures of our ducts, and explained the work they were doing along the way. They were happy to answer any questions that we had, and followed up with us a few days later to see if we had any additional questions or concerns. Next time we need our ducts cleaned, we will definitely be calling Dave. Thank you for an exceptional job! We met this company at the Home Show and ended up purchasing our fridge, stove, and dishwasher from them. Besides getting a great price, we were also very happy with the delivery of the items. The employees, covered our floors so that there would not be any damage and were very considerate of our home. Their customer service was always very professional and pleasant. We were very happy with the service we received from Professional Roofers. They were quick and efficient, and had a very professional attitude. They cleaned up very thoroughly after themselves, which I appreciated. The employees went above and beyond, by bringing us a variety of samples to examine (even when we changed our minds a few times), and even gave us suggestions on what colours would best match the brick on our home. Their referral program is an added bonus. Thank you for a great job! Very competitive prices. Workers came in and installed both items quickly, and cleaned up after themselves. End result was excellent. We didn't get the door knob we requested, and only after phoning the company did we find they were out of stock. It would have been nice to have known that beforehand. They did offer to come out and replace it one new stock was received. Good selection of flooring at a competitive price point. Good customer service IF you don't run into any problems with your product. Do not leave their warehouse without first inspecting your boxes for damaged product. Almost 5 boxes for my project contained cracked, dented, and crushed wood. Vince the manager was completely unsympathetic, and could have cared less about the inconvenience we faced at having to stop our project mid-way through, and having to drive up 3 times to finally get what we paid for. Would have been nice if the managerial staff took a little more pride in their company name and their product. Thanks for the kind words about our vast selection and unbeatable prices. In all honesty though, we are quite confused by your other comments and low rating. Mistakes and/or damage can happen to the best of us, and how we address and resolve same is a true measure of integrity. We thought you were happy and satisfied after our respectful and understanding manager replaced all five boxes even though only half that amount had some damaged boards. We could not be more proud of our dynamic company, courteous staff and top quality products.